At Modex 2012, Hytrol Conveyor’s Boyce Bonham sat down with DCVelocity to discuss distribution center sustainability. We’ve linked the video below, which is worth a few moments of your time. How do initiatives to work greener, smarter, and better affect warehouses and distribution operations? Not surprisingly, these initiatives often save money, at least over the long term. This note came to us regarding one of our Service & Maintenance clients, a major retailer distribution operation in Dallas, TX, and the experience it had with our technician. With a power conveyor out during the evening, the night before a holiday, he needed fast assistance. Temperature gradients occur when air is not moving sufficiently to keep rising hot air mixed with descending cool air, creating warmer temperatures at the ceiling and cooler temperatures at the floor, with temperature variations equal to about .75 degrees per foot of rise. This means there could be six degrees difference from the floor to an 8′ ceiling. 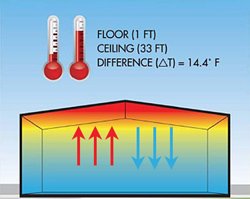 In a 40 ft ceiling room, temperatures can vary 30 degrees or more. At a glance, this seems to be a good thing. 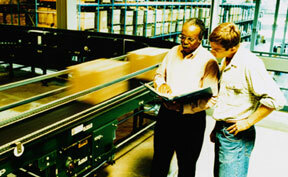 The floor of your facility, where people have to operate is cooler than the air pressed against the ceiling.